A new Oxfam report adds all sorts of price woes to what researchers already feared. Watch Heather Coleman discus findings from the new Oxfam report, Extreme Weather, Extreme Prices. Democrats blame record drought. Republicans blame Obama. But one thing both parties agree on is that food prices are going up. In his acceptance speech at last week’s GOP convention, Mitt Romney openly mocked tackling climate change as the opposite of helping working families, yet pointed to food prices in his long list of ongoing concerns: “Food prices are higher. Utility bills are higher, and gasoline prices, they’ve doubled,” he claimed. 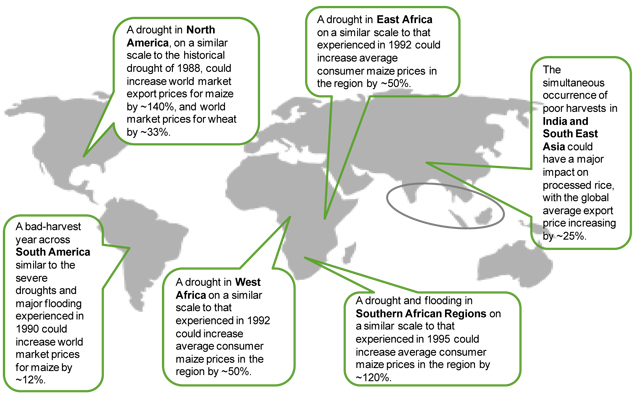 A new Oxfam report released today hopes to close this understanding gap between climate change and global food prices, arguing previous research grossly underestimates future food prices by ignoring the impact of severe weather shocks to the global food system. The report, Extreme Weather, Extreme Prices, argues current research paints only some of the picture by relying on steady increase in temperatures and precipitation. To get a more accurate picture, researchers threw down wild cards—the crazy weather events like droughts, hurricanes, and floods we’ve come to increasingly expect—to “stress-test” the system. They’ve come up with some disturbing numbers. Let’s start with the base-level expectations: The average price of staples like corn could more than double in the next 20 years worldwide compared to 2010 numbers, with rises in temperature and precipitation accounting for up to half of that increase. Then, add the extreme events which researches warn will cause shortages and destabilized markets, risking of a repeat of the 2007-08 food crisis that rocked Africa’s poorest. That crisis in 2007-08 contributed to an 8 percent jump in the number of underfed people in Africa. Oxfam AmericaThe report arrives during a week in which the United Nation’s three food agencies put out a joint statement issuing a warning to tackle food prices now or risk the third food crisis in four years. “Until we find the way to shock-proof and climate-proof our food system, the danger will remain,” the UN said. Expect a week of foodie data: The USDA is releasing fresh household food security numbers, and the UN Food and Agriculture Organization is expected to update numbers on how the US drought is impacting global food prices.